These are awesome! Love the pattern and colors you chose. You’d never know they’re cardboard boxes by looking at the pics! The contact paper is attractive and has a nice, finished look. Then, the addition of the knobs really finished off the boxes. I never would have guessed that these were just cardboard boxes. Nice job! That is such a great idea! I love how colorful they are, plus it dresses up the room so nice! Great idea! 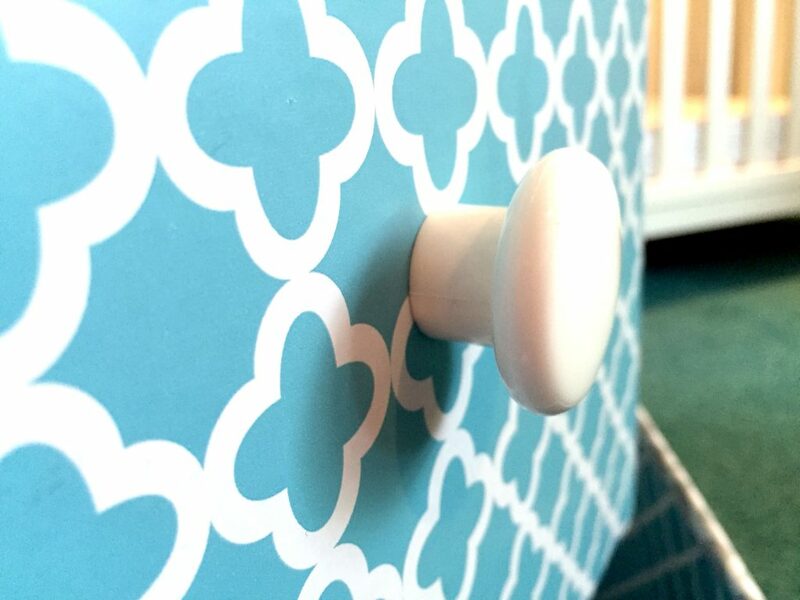 I love the addition of the knobs! 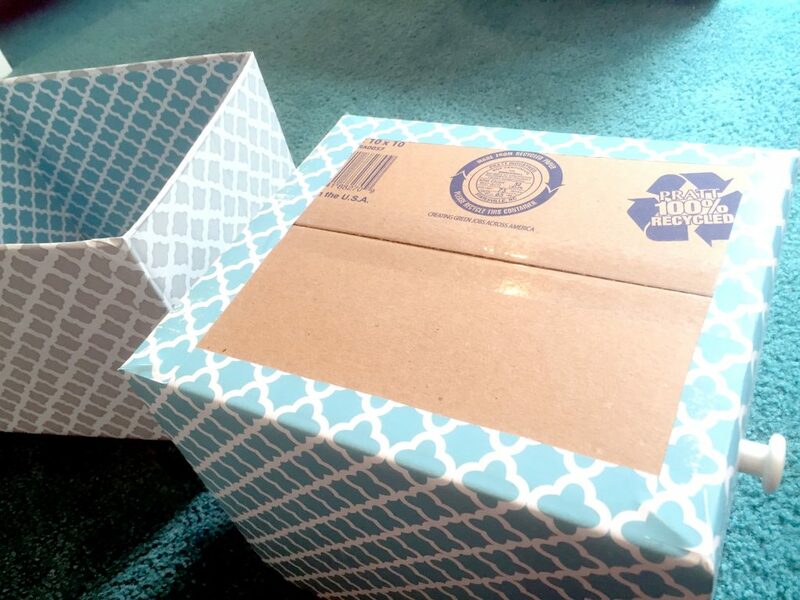 I’ve made boxes very similar but I didn’t think of the knobs – Great idea! Thanks Carol 🙂 The knobs make it so easy! This is awesome. It seems like a fairly simple project that can make a big difference in a room! Thanks Patty 🙂 Yes so simple! Great thrifty idea. I want to comment too on how lovely your nursery looks! Wow! I love that this is so simple and easy. And cheap! Our dollar store always has wonderful selections of contact paper. Thanks for sharing on Amaze Me Monday. Ohh I’m jealous of your dollar store collection! Yes, so cheap! The bins are so expensive elsewhere. Beyond adorable. 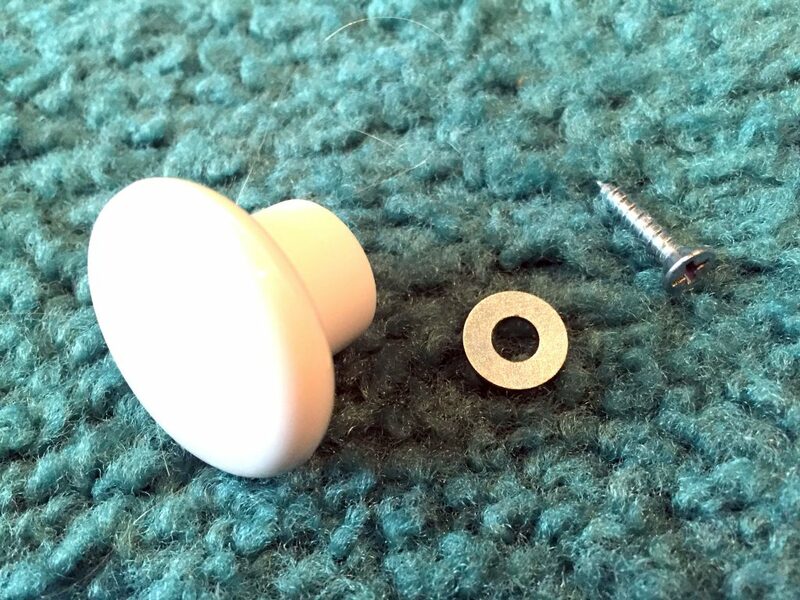 Even though I am severely DIY-challenged (life hashtag: #idkhowtodiy), I might actually be able to do this. Have pinned as a sign of hope and good intentions. 😉 Thanks for sharing…stopping by from #TuesdayTalk! Love your covered box idea. They are awesome. The knobs are a great touch. Your nursery looks so beautiful. Aww thanks Beverly! We LOVED that nursery – that’s one of the only reasons we were sad to move from that house. Oh my gosh how did you know I needed this! This is such a fabulous idea. We used to buy the cardboard ones, but now they only have fabric ones. And they are more expensive!! Yes they are!! This is the perfect alternative 🙂 It does take a little time but totally worth it in my opinion! Such a great economical solution & love the DIY. Pinned & sharing Thanks for joining the Inspiration Spotlight party. Great idea! Thank you for sharing with us on the Art of Home-Making Mondays at Strangers & Pilgrims on Earth! What a fabulous idea! And they are so pretty too. Love those boxes. I made a twine wrapped box, and while it’s awesome, it was definitely a hot glue mess, and took a long time to make. This is fantastic, and fast alternative. Thanks so much for sharing at the #happynowlinkup! What a great idea! I love how aesthetically pleasing these bins are and on top of that so simple and practical! Amazing what you can do with just a cardboard box and contact paper. You did a fantastic job on these! I am going to try some for my granddaughter’s nursery. She has one at my house because I’m the lucky grandma who gets to keep her every day while her parents work. 🙂 I am not good at covering boxes with anything but I’ll give it a go! Visiting from the Sits! Thanks so much, Pam! Awww your granddaughter is so lucky to have a nursery at your house too 🙂 My mom watched my son while I was teaching – and they have such a nice bond 🙂 I think you could handle this project – it was one of my first DIYs. Happy Mother’s Day! Cardboard is most likely all that’s under cloth coverings on premade fold down bins. So smart, I like something I’ve designed for color pattern much more than generic bins. 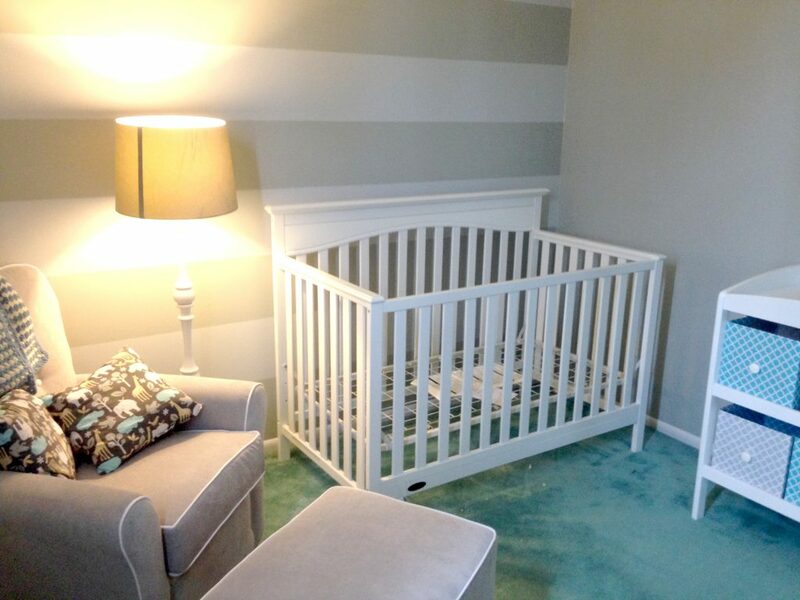 Your son’s nursery looks so nice, love stripes on one wall and bins you made are wonderful. Great job. I definitely need to try this. I’ve been thinking about it for a while. Thanks for sharing! If you’re interested, I think this would make a great post for my Wednesday weekly link up Be Clean Be Green With Kids – a great way to upcycle boxes. http://www.honestlymodern.com/category/blog-101/be-clean-be-green-with-kids-link-up/ Hope to see you there! What a great idea and your tutorial is perfect. At seventy, I don’t need anything like that for a nursery (ha!) but I can see them in the computer/craft room to store all sorts of goodies. Some of the premade fabric units are too tall and your method could provide just the right size for bookcases and cabinets. Well done! Such a cute creative idea! Thanks for sharing! Contact paper is the best! 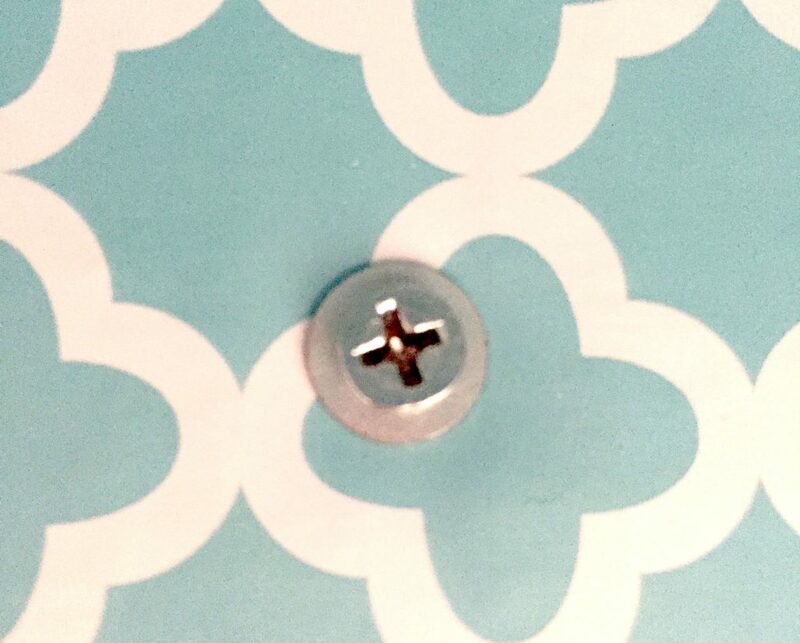 Found this link on the Pierced Pastimes linky party and I’m glad I did! These turned out great. So crisp and clean and my favorite combination of thrifty and beautiful. Featuring when my party opens up tonight! Those are beautiful! Who would have thought they were made out of cardboard boxes?! Pinned. I wish the idea of these bins had been around when my kids were little. They are genius! These are cute. I would think the knobs would tend to pull through the cardboard, but I guess it depends on what you store in them — and how sturdy your cardboard box is. Thanks! They work so well and are pretty! What a great idea! I would never think of making them myself, but you make it seem so easy. I’m definitely going to try this! Thanks Laura! It is easy:) and they turn out so pretty! Fair play, they actually look pretty good. No point paying for something you can make yourself! That’s a very clever idea, I love upcycling projects. Thank you for sharing at The Really Crafty Link Party this week, and happy 2018! These turned out so pretty! It’s amazing what you can do with a cardboard box. What a great money saving storage idea! Thanks for sharing it with SYC. What a clever idea. Thanks for joining us at the To Grandma’s House We Go link party! I really love this idea not just because its a frugal way to have storage boxes. 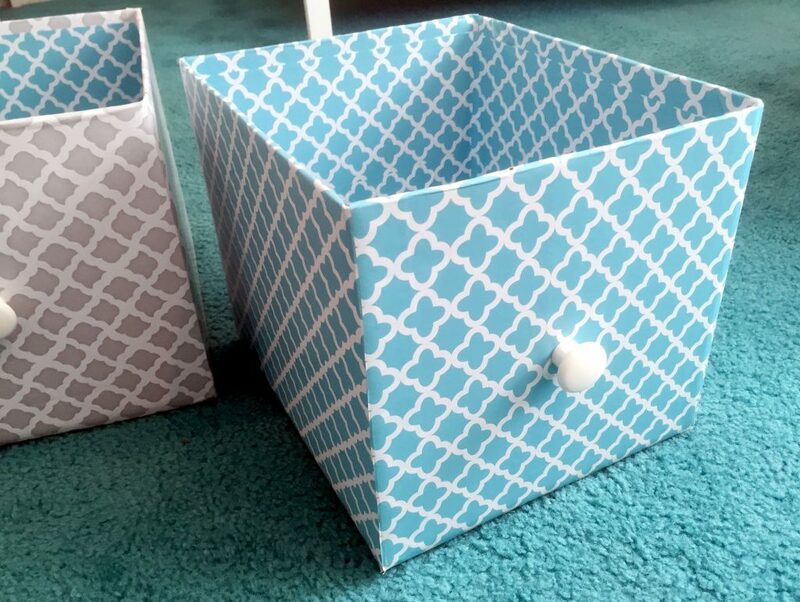 It is also a great way to make those different kinds of storage boxes you already have match each other. Pinning. These turned out perfect! I love the colors and patterns you chose. Thank you so much for sharing your tutorial with us at Party in Your PJ’s. I’ve pinned and I’m also featuring you on this weeks Party in Your PJ’s! Thanks so much Teresa! They’ve held up so great. Thanks for the feature too! Popping in from DIY, Crafts & More Linkup. Love all the uses you can get out of cardboard boxes. This is a great tutorial! Thanks so much, Trisha. I loved them so much that I made all kinds of them for closets and shelves and other areas. I just wonder what is the packing tape for? Thank you! I used the packing tape as a reinforcement with the contact paper at the bottom of the box, or as needed. 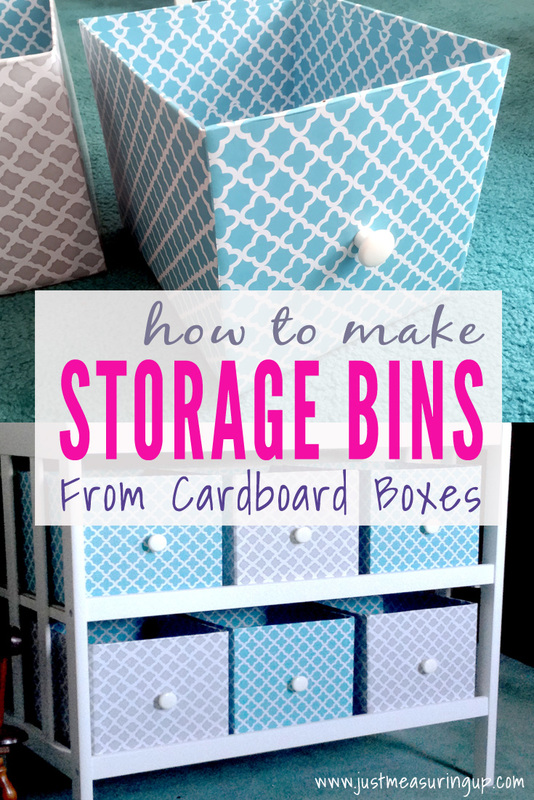 These storage bins look useful and are fun to make. Not only will they look good in the house but also save you some extra bucks.